Command and Control Centers (CCC) or sometimes called Emergency Operations Center (EOC), monitor and respond to a range of potentially dangerous or broken service situations including extreme conditions, major process fault, protected facility intrusion or any other relevant pre-set alarm indication. The EOC oversees service or process operational resources and acts as a hub from which trained operations personnel can coordinate immediate response to various alarm events. It is typically equipped with situation management facilities that facilitate operational readiness, fast decision making and related incident management activities. 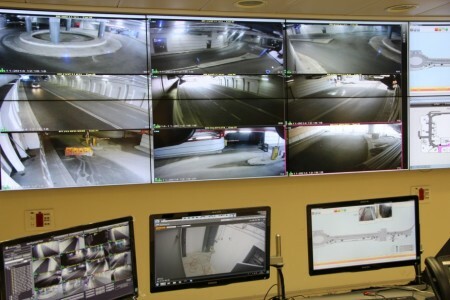 At the heart of a CCC is the ‘Control Room’ (CR) which is the central monitoring station with integrated environmental, energy, security and safety systems that provide for the collection of visual information from various sources such as cameras, sensors and detectors for enabling holistic viewing and analysis of live visual information captured by those dedicated elements. The Video Wall controller such as NVU’s Pavilion is specifically designed to enable collaborative monitoring and fast decision making. It provides the functionality and connectivity to various monitoring systems and the flexibility to accommodate for future growth in the system setup. This high-density Controller directly drives multiple displays with a large amount of visual information collectively and simultaneously being captured, processed and displayed at the highest possible visual quality, operational reliability, serviceability, and all that in affordable manner.